Do not be alarmed by the fact it looks like I read twenty-four books in two months. Nine graphic novels and four short stories very quickly bump up your reading count. 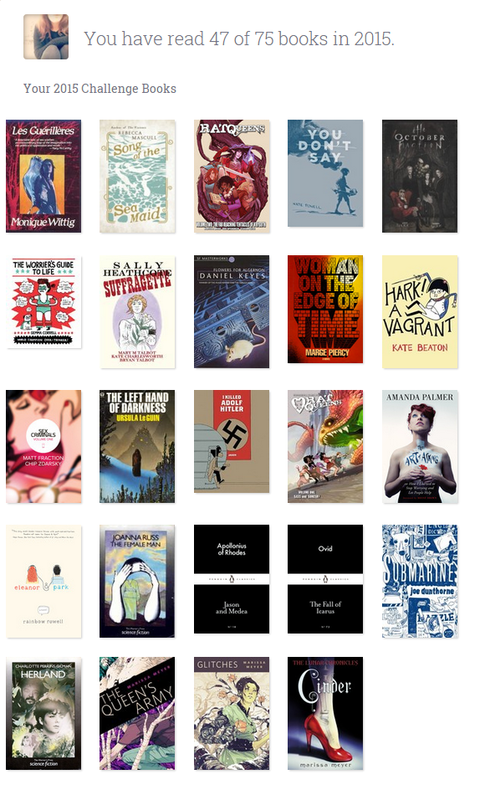 However, it has been a pretty good two months of reading, getting into a new series, catching up on some utopian/dystopian fiction for my MA, and starting my venture into using NetGalley to find things to review. A good month for reading women too! Fourteen out of twenty-four texts were written by women writers, with the stand out books probably being Cinder, The Female Man, The Art of Asking, Woman on the Edge of Time, and Song of the Sea Maid. Reviews of Palmer's and Mascull's books will hopefully be up soon, and you can read about my thoughts on Woman on the Edge of Time here. This was also the month I fell in love with, and read both volumes of, Rat Queens. This is by far my favourite comic series at the moment and I am contemplating buying the single issues of this as they come out simply so I don't have to wait for the next trade paperback to be released. However, I'm very good at buying single issues and forgetting to read them because they're so small and just wander off in my bedroom. We will see what happens, but I heartily recommend everyone to pick up a copy of the first volume of Rat Queens to give it a go. The fantasy D&D-inspired universe is fantastically immersive and every single character is as lovable as the next. The dialogue is incredibly witty and anyone craving good female characters will be satisfied by Rat Queens. I finally delved into my collection of Little Black Classics in April and am planning on writing mini-reviews for the ones I've read over the next few weeks. If you want to hear my thoughts on any books I've read over the past two months, or ever really, please check out my Goodreads where you can find all of my star ratings and random thoughts throughout the reading process.